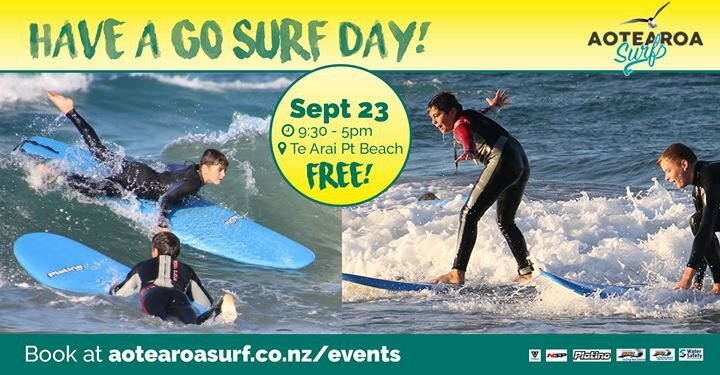 A safe, easy & fun ‘learn to surf’ day for all level of surfers with prizes and giveaways from Aotearoa Surf & our sponsors.. and totally FREE! Aotearoa Surf & the surf industry are committed to bring more and more people to the sport of surfing and there is no better way to showcase than to give our future generations the opportunity to try surfing when they are young! Offering kids and young adults (4-16yo) who may be new to surfing, beginners, intermediate surfers or have never surfed before! All surfboards, wetsuits, sunscreen and coaching provided by Internationally qualified and experienced instructors, first aid certified and surf lifesaving awarded. Covering beginner and intermediate level lessons incorporating beach education and safety! Ages 4 to 16 with scheduelled times for ages and skills. BOOK NOW into your selected times spaces strickly limited.